At the ripe old age of 41, I have seen trends come and go. None was annoying as the Cabbage Patch Kids. Back in 1977 an artist named Xavier Roberts stumbled upon the idea of having people "adopt" cute squishy faced dolls. Roberts' toys grew in popularity until they became a must-have toy in the early 1980s. 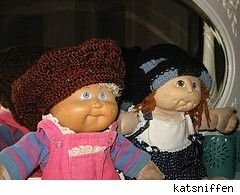 Cabbage Patch Kids even spawned a satirical counterpart named Garbage Pale Kids. My older sister Laura had one of the dolls. Being a bratty younger brother, I took it upon myself to "kidnap" her Cabbage Patch Kid from time to time. I think I even held the doll for "ransom." Luckily, Laura forgave me for my misbehavior. Unlike other relics of the 1980s such as David Hasselhoff, the Cabbage Patch Kids still are going strong. I remember they had talc smell. Maybe that makes people think they are holding a "real baby." To be realistic, they would need to smell like poop. Cabbage Patch Kids are a triumph of marketing. Tens of millions have been sold over the past 25 years. The dolls have wound up on postage stamps and been the official mascot of the U.S. Olympic Team. Their appeal continues to elude me. Nonetheless, they have become prized collectibles, which is quite a feat for something that many people thought would end up in the pop culture dustbin around 1983.